If you are a fresher and seeking for the good opportunity in the IT Sector then this Accenture Off Campus 2018-2019 Drive helps a lot. Every year the Accenture is hiring the freshers for various vacancies. Accenture is an MNC company. Getting the job in this leading company is not such easy but possible. So for the sake of the candidates, we are providing the latest Accenture Recruitments 2018-2019 for freshers in this article. Also, they noticed that all 2018, 2019 passed outs can also apply for the Accenture Off Campus 2018-2019. The aspirants who want to make their career bright in the company can apply for the Accenture Careers by checking from this page. 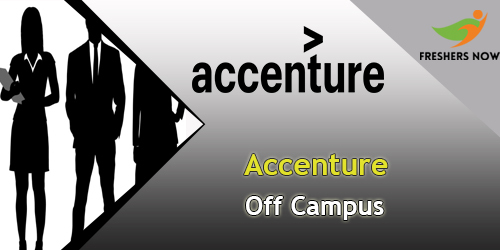 The freshers who had recently completed their education can proceed with the Accenture Off Campus 2018-2019 Application Process. Before that check the eligibility details, selection process, skills and documents required, registration process from this page. Have a look at the below of this page and apply for the suitable positions. Accenture invites applications from the dynamic and eligible candidates for various positions. Nowadays most of the candidates are choosing the IT Jobs as the career option. In order to help them, we are providing the Accenture Off Campus 2018-2019 Drive details on this page. We know most of the candidates are not able to get the apply link. By keeping that in mind we are providing a direct link in the bottom of this page. In the above table, we have furnished the complete details about the Accenture Company in an understandable manner. Basically, the Accenture pick the candidates who are with good communication skills. Apart from this, all the applicants have to undergo the selection process which conducts by the company people. The candidates have to clear the Online Aptitude Test first. Before going ahead to apply for Accenture Jobs 2018-2019 the candidates have to check the eligibility criteria compulsory. If any of the aspirants applied without meeting these criteria those applications will be rejected. Good understanding of Java, Core Java concepts. Must have excellent verbal and oral communication skills with the email etiquette. Agree to work in 24*7 shifts. Able to relocate to any location in India. Should have a desire to work on any information system. Have problem-solving skills by understanding the bug. Every year the company conducts the recruitment process to recruit the eligible candidates. In the process of the selection, the candidates have to give the Online Aptitude Test, Technical Interview, HR Interview. In the Online Aptitude Test, the aspirants have to answer various questions of Quant, Verbal, Reasoning etc. Each section carries the different number of questions for different marks. Generally, the Accenture conduct the Online test through the AMCAT. To perform well in the online test the aspirants can use pretty information like the syllabus and the placement papers from our website. Our team tried their best to collect the information and equipped in one place. We suggest the aspirants have a glance at the useful stuff and crack the Accenture Off Campus 2018-2019 easily. Later on, clearing the online test the aspirants have to face the Technical and Interview rounds. Answer all the questions confidently and get the job in Accenture. The company offers pretty good salary package and extra benefits for the selected candidates. Here we are specifying the Accenture Test Pattern based on AMCAT. The Test consists of questions from the various sections like Quantitative Aptitude, Logical Reasoning, and Verbal Ability. Each section consists of 25 questions each. The time duration to complete the Quantitative Aptitude, Logical Reasoning is 35 Minutes each and the Verbal Ability is for 25 minutes. The paper comprises of 75 questions. The total exam is for 95 minutes. 20 Questions from Analytical Aptitude and the candidates have to answer these questions in 30 minutes. Candidates have to solve 20 Verbal Ability questions within 20 minutes. 15 Questions will be from attention to the details and have to complete in 20 minutes. The total exam consists of 55 questions and the time duration is 1 Hour. The Overall Accenture Online Test will be moderate to difficult. So the applicants have to concentrate on their preparation. While appearing for the Accenture Off Campus the candidates have to carry the following documents. To help and guide the candidates in the registration process we have provided some of the steps in the below section. At first, visit the official website of Accenture that is accenture.com. Scroll down the home page and check for the “Career” link. A page display on the screen. A search box appears on the page. Enter the job title and proceed to search. The current openings will appear on the screen. Select the suitable job as per your interest and apply for it. Fill all the details and submit the form before the last date. After referring all the applications the officials will send an Email to attend for the drive. So the contenders have to take a print out by of the page by using the Ctrl+P. Candidates have to carry this call letter along with them to have an entrance for the Accenture Off Campus 2018-2019 Drive. Hope all the freshers can use this information and apply for the off-campus drive. For more updates visit our website freshersnow.com. Didn’t get your comment. Please write clearly.